It’s been just one month since easyJet’s new augmented reality bag scanning feature first hit headlines around the world. As with any new feature we develop, we wanted to check in on how it’s performing: Are people actually using it? When are they using it most? What locations are they most likely to use it in? To answer the first question, it’s been a resounding ‘yes’—there have been over 60,000 unique scans since it launched on February 11. 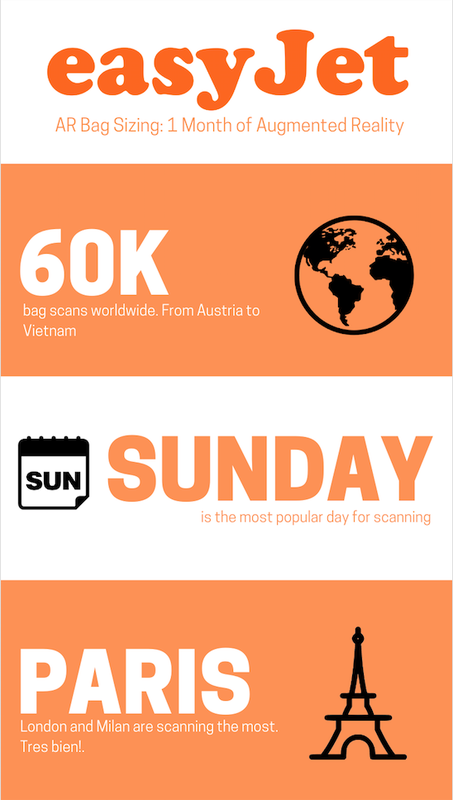 Sunday is the most popular day for AR bag scans in the easyJet app—most likely due to users checking their bag fits before going on holiday or a business trip. The feature has been used around the world, from Austria to Vietnam, and is most frequently used in fashion-famous cities like London, Paris, and Milan. This short infographic gives the highlights. To find out more about the work we do with easyJet, download our case study.